The 2012–2013 Leo Baeck Fellows, who are based at academic institutions in Canada, the Czech Republic, Germany, Great Britain, Poland, and the United States, convened in Brighton,England, for an introductory workshop from 5–7 November 2012. 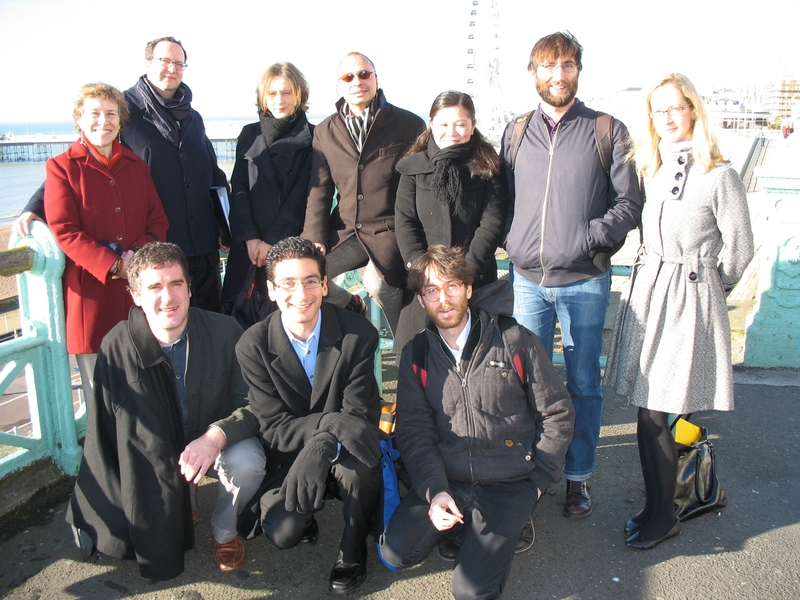 The workshop was organized and led by Matthias Frenz (Studienstiftung des deutschen Volkes), Raphael Gross (LBI London), and Daniel Wildmann (LBI London). The special guest was Marion Kaplan, Skirball Professor of Modern Jewish History atNew York University. In advance of the workshop, the ten Fellows distributed papers introducing their central research questions and sources. Upon meeting in Brighton, Fellows gave short presentations summarizing their projects’ key concerns; these presentations were followed by commentary from other Fellows, as well as broader discussions among the workshop’s participants. This format allowed Fellows to become acquainted with each other’s research topics, offer references and suggestions, and receive helpful feedback on their own work. The workshop displayed a remarkable variety of topics and approaches within current scholarship on the history and culture of German-speaking Jews. Indeed, the Leo Baeck Fellows come from a wide array of disciplines, including Art History, Film and Media Studies, German Studies, History, Jewish Studies, Philosophy, Religious Studies, and Sociology. Their research spans from the thirteenth century to the mid-twentieth century, and encompasses geographical regions in the present-day Czech Republic, Germany, and Poland. The opening two presentations considered Jews’ involvement in the cultural and intellectual life of the Weimar Republic, with particular attention to German cinema and the Berlin Doctors’ Chorus. The following morning, two Fellows addressed the role of Central European Jews in early-twentieth-century political movements — one focusing on Puah Rakovky’s and Rahel Goitein Straus’ involvement in pre-state Zionism, and the other on youth activity in radical Socialist and Communist movements in Czech lands. That afternoon, two Fellows placed the philosophical work of Franz Rosenzweig and Martin Buber in an intellectual-historical trajectory extending back to the Enlightenment. The day’s concluding presentation considered micrographic ornaments in medieval Ashkenazi Bible manuscripts. On the final morning, two Fellows discussed the modernist thinkers Siegfried Kracauer, Rosenzweig, Gershom Scholem, and Walter Benjamin, and one Fellow presented on the Jewish population in Szczecin, Poland, in the wake of World War Two. Workshop discussions were extremely stimulating and productive, taking up many methodological questions involved in historical study. What is the ideal scope of a scholarly project? How does one evoke the broader and ongoing resonances of detailed, historically grounded research? To what extent must one relate philosophical ideas to the context of their development? When should one thematize the relationship between oneself and the subject under investigation? And in what ways might researchers redress the oversights of prior scholarly accounts? The workshop affirmed German-Jewish history and culture as an extraordinarily rich and vital area of inquiry. The Leo Baeck Fellows greatly appreciated the opportunity to converse with each other and with senior scholars in the field—both during workshop sessions and in more informal contexts. The Fellows have been continuing their discussions and intellectual exchanges throughout the 2012–2013 academic year, and look forward to reconvening at the next workshop in Rastatt, Germany, from 7–10 July 2013.